Using strobes can be a very powerful tool in photography. Using gels on your strobes is even better! Usually you would use a gel on a speedlite to help balance your flash with the ambient light. 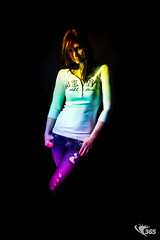 For this shot, I wanted to utilize my speedlites and gels to get a rainbow effect on the subject. Each speedlite has its own gel, starting at the top with a red gel, then yellow, green, blue, and purple. I'm using 2x 580ex II's, 2x 430ex II, and a YN467 (which I purchased to test the RadioPopper RPCube with the flashes ETTL settings, that will be another blog post). Each flash, aside from the YN467 was triggered with a RadioPopper JrX. Each light was set to the same power output. The camera being used was the Canon EOS 7D, with a 16-35mm f/2.8L lens. The camera was set to ISO 100, zoomed in to 26mm, shutter speed at 1/200 sec, and aperture set to f/16. About 30 pictures were taken, then imported into Adobe Lightroom to go through a rate the photos. The 30 images were rated down to about 6 images, then about 3. In lightroom, some adjustments were made such as clarity up, noise reduction up, blacks down, and I adjust the luminance of each color until I liked the final look of the shot. The only issue I had with taking the photo, wasn't triggering the flashes, but having all the flashes recycle fast enough. I use Sanyo Eneloop batteries, so recycle time isn't an issue, but since I was using so many flashes, and because I didn't have fresh batteries in each flash, each flash ended up having different recycle times. Gel Your Flashes Using strobes can be a very powerful tool in photography. Using gels on your strobes is even better!